So, I am trying to be healthy at the moment, not only am I trying to stick to a certain amount of calories a day, but I am trying to get in my 5 a day too ! So, I took to the wonderful internet in search for different recipes. I will share any that find and think are worthy. This one however, I kind of made up myself. With some help from a friend ! I wanted this to feel like a treat, so I got a lovely wholemeal (healthy see!) organic loaf for a bargain price of 80p ! As soon as I got it home I sliced it, popped it in food bags and stuck it in the freezer as normally bread like that goes bad after a day or so.. I was going to get my monies worth !! So I took a slice, toasted it and topped it with my guacamole and it was sooo yummy !! 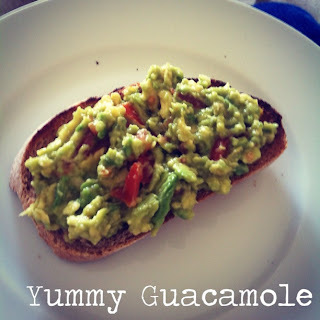 I don't like avocado on it's own, but I think the beauty of this is the garlic and lime juice !